In addition, the Parish did not obtain adequate documentation from Thompson Thibodeaux supporting all of its expenditures as required by federal regulations.11 Parish employees confirmed that they did not require documentation supporting payments of expenses actually incurred by Thompson Thibodeaux prior to payment. Instead, the Parish only required Thompson Thibodeaux to provide documentation indicating that it (Thompson Thibodeaux) was obligated to pay eligible expenses. The following indicate possible violations of state and federal laws and federal regulations. According to Department of Social Services (DSS) correspondence in May 2005, former state representative Derrick Shepherd M helped Thompson Thibodeaux obtain a $100,000 grant from DSS, which was funded through Louisiana House Bill number one of the 2004 Regular Session. 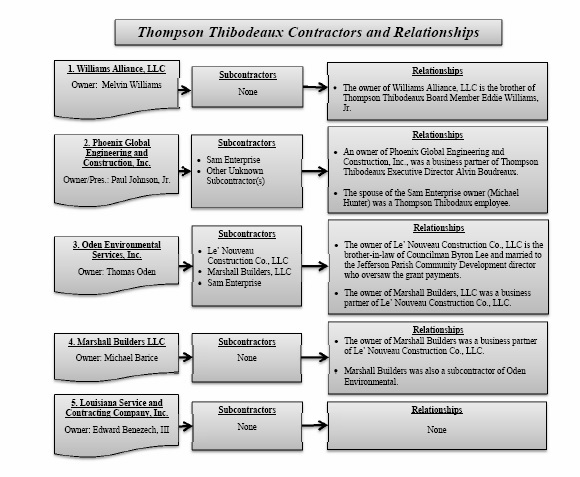 On May 19, 2005, Thompson Thibodeaux deposited a $100,000 grant check from DSS into its bank account. On the same day, Thompson Thibodeaux issued a $100,000 check payable to Faith Academy which was deposited into a Faith Academy bank account. According to Eddie Williams, Jr. he signed two blank Faith Academy checks at the request of former Thompson Thibodeaux and Faith Academy Executive Director Alvin Boudreaux (now deceased). On May 27, 2005, two Faith Academy checks, one for $56,000 and the other for $500, were written payable to Cynthia Cavalier. Both checks were endorsed using the name of Cynthia Cavalier-Shepherd. When we asked Ms. Cavalier-Shepherd what services she provided for these checks, she asked for an attorney and refused to answer our questions. Mr. Eddie Lee Shepherd, Ms. Cavalier-Shepherd’s husband and the father of Derrick Shepherd, told us that Ms. Cavalier-Shepherd is Derrick Shepherd’s step-mother. We later sent Ms. Cavalier-Shepherd a certified letter requesting a meeting with her and her attorney. We received no response. Mr. Williams further stated that in June 2005, the Thompson Thibodeaux board of directors discovered that the two checks paid to Ms. Cavalier-Shepherd were not for a mentorship program and that the board replaced Mr. Boudreaux with Jerome McGowan as Thompson Thibodeaux’s executive director. According to Mr. Williams, after the board discovered the checks were paid to Ms. Cavalier-Shepherd, he and Mr. McGowan went to Derrick Shepherd and demanded documentation to support the purpose of the funds paid to Ms. Cavalier-Shepherd. Mr. Williams stated that Derrick Shepherd provided him and Mr. McGowan with an IRS Form 1099 issued by Faith Academy to Ms. Cavalier-Shepherd and stated that she was given the funds because her house had burned down. During our audit, we did not find any record of a fire reported on property owned by Ms. Cavalier-Shepherd. Furthermore, our review of the IRS Form 1099 revealed that the Social Security number reported for Ms. Cavalier-Shepherd was not her correct Social Security number (the last digit in the number was not correct). Derrick Shepherd refused to meet with us (LLA auditors). However, during a telephone conversation with us, Mr. Shepherd stated that he did not recall having any interaction with or obtaining grants for Thompson Thibodeaux or Faith Academy. M During an interview with LLA Auditors, former Councilman Byron Lee stated that Derrick Shepherd was his cousin. Like I said folks the entire 472 page report is well worth the read. If you want to know why taxes are as high and services to the public are not provided look no further because this is your tax dollars at work. Finally the connections to West Jefferson Medical Center should merit everyone’s attention as this type stuff is evidently business as usual for the institution. It is the same players on the Parish council, along with the gang at West Jefferson Medical Center pushing Children’s Hospital in a deal worth far less financially than the one offered by HCA to operate the Parish’s two taxpayer funded hospitals. Given the myriad of ways this bunch wastes tax dollars does anyone really trust Mark Spears to look out for the public’s interest in that deal, worth hundreds of millions of dollars to Jefferson Parish? Stay tuned I imagine more is coming down the pike. Jim Letten’s lack of investigation into Byron Lee’s political doings may have to do with the co- involvement of the WJ and EJ Hospital Board teams, namely the millions both EJ and WJ contributed to the mismanaged non-profit medical clinics for the poor controlled by Lee cronies, as well as the local politicos and their relatives influencing each Board.Remember also, Letten, a republican appointment, was walking a tight rope while serving at the pleasure of the Prez. and his Attorney General as evidenced by the Danzinger Bridge turnaround from local nolle prosequi to big time Federal prosecution and later dropping all charges on Heebe & Co. due to prosecutorial misconduct but also to possibly preserve and not reverse the Feds’ prior Danzinger civil rights convictions. You asked me not to blog on your site until now I have honored your wishes however I would like to correct a couple errors. The first is, what I started to disclose at 9/18/13 council meeting was misappropriations of grant funds regarding Peoples Community Subsidiary Inc. of which was not in the states legislative audit. The second is that I was ambushed in a premeditated act following my e-mail response to the parish attorney’s office and council members a few days earlier disclosing the misappropriation of funds. You should be able to do a PRR for those 2 e-mails with my attachments, it would also be interesting to see the exchange of e-mails that it created . Clearly this was done in an attempt to discredit me publicly in a demeaning manor which turned into a physical assault without just cause that sent me to the hospital. Although I have called the FBI no one has contacted me back so that I may file a formal complaint so I am left with the perception that the individuals that you would like to sit down and speak with is not just Letten’s office. What is the deal with “Peoples Community Subsidiary, Inc.” as it does not appear on the Sec. of State’s website? Business: PEOPLE’S COMMUNITY SUBSIDARY INC. I do not remember banning you Tom though I do remember the tiff. I appreciate the clarification and correction. You’re welcome to comment here anytime. Tom, I tried to view your personal expulsion at the 9/18/2013 Council meeting after the Sistas for Good Government at the 10/16’/2013 Council meeting complained about the Council depriving you of the right to free speech. It seems though that part of the 9/18/13 video replay of your Council report and expulsion was deleted or redacted and if this is true the Young Administration and the CAO in charge of the internet video replay need to be held accountable as aiding and abetting the Council in their diabolical attempt to prevent whistleblowers from reporting crimes involving misappropriation of non-profit grant funds. Have you tried to get a copy of the video replay of your incident at the Council meeting held 9/18/13 ? No I have not tried to download the footage in the meeting room I have been a bit busy . I would also believe the hallway and elevator cameras have been more than likely redacted too? I have been told by the Justice Department they do not do investigations to call the FBI where after several calls of being assured someone would contact me, here we are almost 2 months later, I doubt neither of the desk agents wrote my information down ? So be it, I look forward to this weeks council meeting ! I’m sure you haven’t had time to go through all 472 pgs of the LLA audit yet but check out the consultant named on pg 356…. Stacey L. Jackson. Previous Previous post: There really is a method to the madness….